Your number one fall wardrobe staple? A utility jacket. These edgy pieces are perfect for chilly weather, and they can breathe new life into any outfit — from girly to grunge-inspired. Plus, you’ll look just like Lindsay from Freaks and Geeks. How could you not fall in love? Below, check out two outfits I’ve created around one of these must-have jackets. Whether you’re not sure about the trend or just looking for wardrobe inspiration, you’ve come to the right place! Get back into the swing of campus life with a super comfy outfit that’s still totally chic. 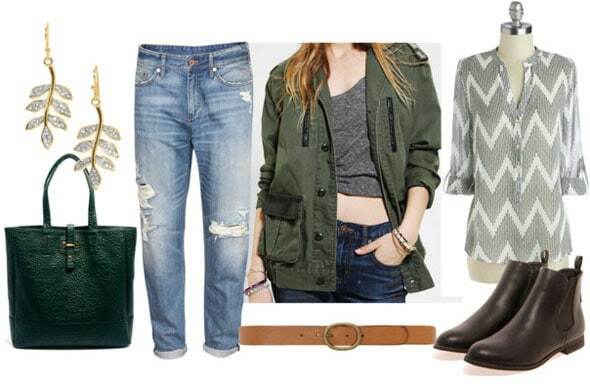 Pair an on-trend chevron blouse with a killer pair of boyfriend jeans to soften the look of the jacket. Then add a neutral brown belt at the hips and classic chocolate brown booties for that girl-next-door vibe. Next, grab an emerald tote to spice things up a little, then complete the ensemble with a pair of girly dangly earrings. Amp up the grunge with a vintage-inspired tunic dress — I kind of love how this dress from Topshop looks like an edgy version of my grandma’s old tablecloths. Modernize the ensemble by belting your dress at the waist with a chocolate brown belt, then add a little contrast with a deep berry clutch. Try a pair of peep-toe mossy green pumps (love the color!) and edgy black floral earrings to complete the look. 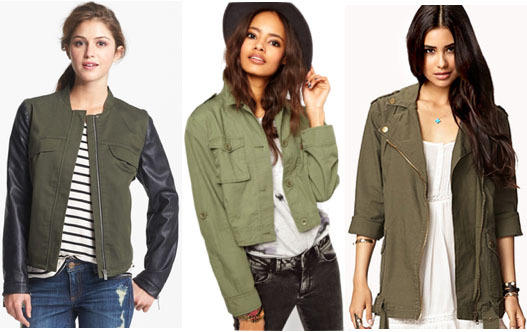 Do you love the military-inspired trend? How would you style this jacket? Be sure to let me know what you think of the outfits in the comments, and what other pieces you’d like to see featured on Class to Night Out!